The West Point Mint: The West Point Academy Hosts the Nation’s Newest Mint. The West Point Mint joined the family of US Mints in 1988. Located on the grounds of the West Point Military Academy in New York, the Mint is a relatively new addition to the Army’s long presence at West Point, which dates all the way back to the American Revolution. The primary mission of the West Point Mint is to produce bullion coins and commemoratives. Hit the "Saga of the US Mint Chapters" link at the upper right to choose other US Mint facilities to study. The headings directly below are units of the West Point Mint chapter. West Point: "Key to the Continent"
The "Fort Knox of Silver"
Sketch of the American position at West Point, as taken from the description of a deserter, June 9, 1779. Gun emplacements, fortifications, and the "Great Chain" stretched across the Hudson are shown. Image courtesy of Geography and Map Division, Library of Congress. 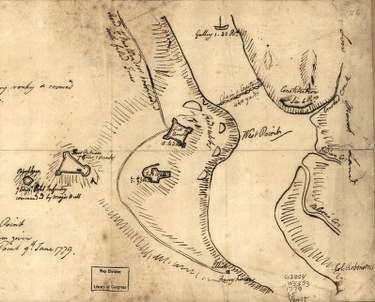 Only one month after the Revolutionary War began at Lexington and Concord in 1775, the Continental Congress formally acknowledged the importance of establishing a defensive fortification somewhere on the banks of the Hudson River. If not, the British could potentially split the American forces in two by sailing upstream along the crucial waterway from their New York City stronghold. By 1778, it was clear that a place called West Point, a scenic highland plateau overlooking a sharp turn on the Hudson, would serve ideally as a defensive position against invading Redcoat ships trying to navigate around the "Point". General George Washington himself described West Point as the "key to the continent", and sent one of his most trusted officers, Thaddeus Kosciuszko of Poland, there to safeguard the heights. In addition to constructing a daunting series of forts and gun emplacements, Kosciuszko instructed Continental troops to stretch a 500 yard chain weighing 50 tons across the Hudson, from West Point to Constitution Island (then known as Martelaer's Rock). The chain was suspended in the water by floating logs, providing an effective barrier against British ships advancing up the river. 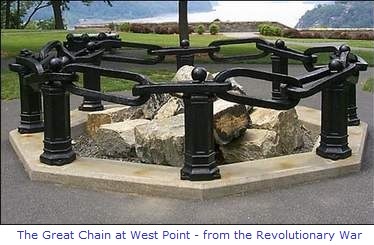 Several of the links from the "Great Chain" extended across the Hudson during the Revolution are preserved on the grounds of West Point. Each link weighs 114 pounds. Image courtesy of US Military Academy, West Point. The British never tried to breach West Point's defenses, but through underhanded means, still nearly captured the strategic base. In 1780, American general Benedict Arnold plotted to betray West Point to the Redcoats, but the plan was foiled by the capture of British spy John Andre. Perhaps the Revolution might not have ended in victory had West Point fallen. The United States government purchased 1,770 acres of West Point land from private citizen Stephen Moore in 1790, for the purpose of maintaining a permanent military presence there. The government paid $11,085 for the property. 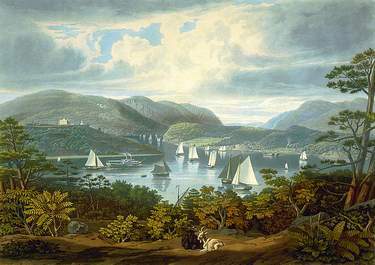 An 1831 view of West Point looking northwest across the Hudson from Phillipstown. Two goats in the foreground are enjoying the day, as are many sail boaters on the river. Image courtesy of Library of Congress. As early as 1783, George Washington had proposed the concept of a special federal school at West Point to train army officers, but critics viewed it as too European, replete with the danger of creating an elite military aristocracy. Eventually, more people accepted the wisdom of Washington. 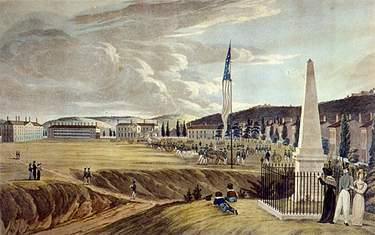 After receiving assurances that the academy would be representative of a democratic society and not a haughty institution for the privileged few, President Thomas Jefferson signed into law an act of Congress on March 16, 1802, creating the United States Military Academy at West Point. The school's first buildings were built on an imposing bluff overlooking the Hudson River. Sylvanus Thayer, the West Point superintendent from 1817-1833, is today remembered as the father of the Military Academy. Image courtesy of Libraryof Congress. The first West Point class numbered only 10 cadets. In its earliest years, the academy struggled because of a poorly defined mission, internal dissention, and insufficient staff. It wasn't until Sylvanus Thayer (Class of 1808) was appointed superintendent in 1817 that West Point began to grow and establish rich traditions. Thayer combined officer trainer with higher academic standards, complemented by a strict code of conduct. Under Thayer's tutelage, West Point emerged as the nation's preeminent civil engineering school. Graduates of the USMA were largely responsible for many of early America's engineering marvels; dams, harbors, bridges, charting unexplored lands and rivers, forging an infrastructure of pioneer roads and railway lines, and constructing the dome on the U.S. Capitol. Near the start of 20th century, the ingenuity of the Army Corps of Engineers led to the construction of one the most magnificent human achievements of all time, the Panama Canal. The Plain at West Point, 1828, by George Catlin. The North Barracks are on the left, The South Barracks, Academy, the Mess Hall, and the Wood Monument on the right. Public domain image. Ringing true to its creed of nationwide inclusion, an 1843 law mandated that all congressional districts in the United States be represented by at least one cadet at West Point, guaranteeing the academy remain an institution for all of America. When West Pointers were not busy extending the nation's frontiers, they were forming the core of the Army's finest officers. Throughout America's wars, graduates of the USMA proudly fulfilled the academy's motto of "Duty, Honor, Country", and in the process, helped preserve freedom for the people in America and around the world, and boost the United States to its current status of superpower. Some of the most famous military minds to pass through the halls of West Point include Ulysses S. Grant, Robert E. Lee, John J. Pershing, Dwight D. Eisenhower, Douglas MacArthur, and Norman Schwarzkopf. 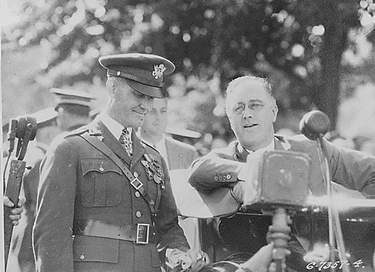 President Franklin Roosevelt on the grounds of West Point, August 27, 1934, chatting with an unidentified Army officer. Not long thereafter, FDR approved a new federal silver depository at West Point. Image courtesy of National Archives. In the 1930s, the Treasury Department determined that an impregnable storage facility was needed to house 70 tons of government silver bullion reserves. President Franklin D. Roosevelt gave final approval to build the new facility at West Point: as a military compound, plenty of security was already in place. What's more, the important financial district of downtown Manhattan was only 50 miles to the south. The Department of Defense turned over to the Treasury a four acre plot nestled at the foot of the academy's ski slope, not far from the Washington Gate (formerly known as the Old North Gate). Construction of the austere single story facility began at this site in 1937. To thwart would-be thieves, the windowless walls were composed of three-foot-thick reinforced concrete. When completed the following year, the new facility was officially designated as the West Point Bullion Depository. Encircled by barbed wire and sentries with machine guns, the location was often dubbed the "Fort Knox of Silver". In the 1970s, a severe shortage of one cent coins caused Treasury officials to look to West Point as an alternative to boost penny production. On August 1, 1974, the Depository began minting Lincoln cents. These coins bore no mintmark, and were therefore indistinguishable from those made at the Philadelphia Mint. Bicentennial quarters, followed by regular Washington quarters in the years 1977-79 likewise rolled off West Point's coining presses. In all, millions of coins flowed into the channels of commerce from West Point. Not bad, for an unofficial minting facility. 1984-W gold eagle commemorating the Los Angeles Olympic Games. This was the first coin to bear the "W" mintmark. At the time this coin was issued, West Point had not yet been awarded mint status. In the early 1980s, the West Point Bullion Depository added some 20 billion dollars in gold reserves to its vaults, making it one of the world's biggest stashes of the yellowish metal. 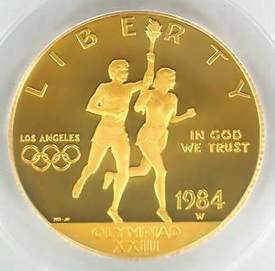 In September 1983, the "W" mintmark appeared for the first time, when West Point began striking $10 gold eagles commemorating the 1984 Los Angeles Olympic Games. This was the first legal tender US gold coin issued since 1933. In 1986, the "mintmarkless" American Eagle gold and silver bullion coins were introduced, with West Point selected as the sole production facility. As the 1980s progressed, West Point took on an increasingly larger role in the Treasury Department's plans. The relatively small facility on the grounds of the storied US Military Academy was making quite a contribution toward the success of America's coinage system. Its consistent production capability and quality workmanship were widely recognized, and soon to be rewarded. 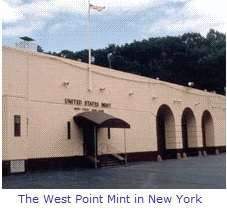 The West Point Mint, formerly known as the West Point Bullion Depository, was granted mint status on March 31, 1988. Image courtesy of US Mint. On March 31, 1988, the facility at West Point was elevated to that of a full fledged United States Mint. This marked the first occasion since 1862 that a new branch mint was named, when Denver joined the family of US Mints (though the first coins were not produced there until 1906). Since then, the West Point Mint has taken on two primary areas of responsibility: sole production of the entire series of American Eagle proof and uncirculated bullion coins (silver, gold, platinum), and all gold commemorative coins, plus a few made of silver. All commemoratives leaving the West Point Mint are struck with the distinctive "W" mintmark. The silver bullion coins are offered only in $1 face value denomination (1.00 oz. ), and are characterized on the obverse by an image of walking Liberty, a spin-off of A.A. Weinman's highly acclaimed half dollar design of 1916-1947. Examples of American Eagle bullion coins minted at West Point. The silver $1 (1.00 oz.) is at left, $50 gold (1.00 oz.) top right, $100 platinum (1.00 oz.) bottom right. Photos courtesy of Ira & Larry Goldberg Coins & Collectibles, Inc., Beverly Hills, CA. The gold bullion coins come in four denominations: $5 (.10 oz. ), $10 (.25 oz. ), $25 (.50 oz. ), and $50 (1.00 oz.). The obverse on all sizes features an adaptation of American sculptor Augustus Saint-Gaudens' classic design of advancing Liberty, first displayed on double eagle gold coins minted from 1907-1933. 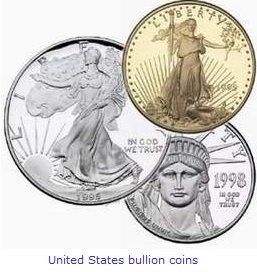 Platinum bullion coins were made available starting in 1997, and are sold in denominations of $10 (.10 oz. ), $25 (.25 oz. ), $50 (.50 oz. ), and $100 (1.00 oz.). On the platinum coin obverse a close-up view of the Statue of Liberty is shown. The West Point Mint continues to operate as a gold bullion depository for the US government. Silver is also kept on hand, but only in quantities sufficient to meet silver coinage demands. Today, the United States Military Academy at West Point consists of nearly 16,000 acres (25 square miles), over which more than 1000 structures are dispersed. Enrollment has been held steady at 4000 cadets for many years, and competition for the coveted slots is fierce. About 15 percent of the school's attendees are women. 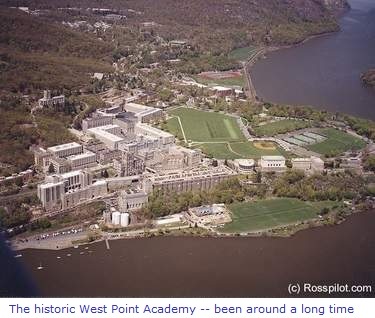 An aerial view of West Point, as it appears today. Soldiers have been garrisoned here continuously since 1778, making it the oldest of all American military installations. Aerial photography by Rosspilot. The Academy's education curriculum has changed remarkably in recent decades. In addition to rigorous military skills training, cadets are permitted to major in any one of more than a dozen fields, from the sciences to the arts. All graduating cadets receive a Bachelor of Science degree, designed specifically to meet the intellectual demands of a commissioned officer in today's Army. West Point graduates are awarded a rank of second lieutenant, and are required to serve on Army active duty for a minimum of five years. The Academy generates more than 900 newly minted officers annually, representing about one-fourth of the new lieutenants needed by the Army every year. As the Academy heads into its third century of service, the venerable institution remains steeped in tradition and yet dynamic, enticing some of the best and brightest young men and women. It offers a challenging and exhaustive range of opportunities while highlighting its long-standing commitment to Duty, Honor, Country. As the West Point Academy approached its 200th anniversary in 2002, a special commemorative silver dollar was designed to celebrate the bicentennial of institution's founding. The obverse depicts a cadet color guard in parade exercise with Washington Hall and Cadet Chapel in the background. The reverse illustrates the Academy's Bicentennial Logo, featuring the school's revered symbol, the helmet of Pallas Athena. The West Point Bicentennial commemorative dollar coin is available in Proof and Uncirculated condition. A total of nearly 384,000 were sold by the Mint. Image courtesy of US Mint. The new coin was unveiled by the US Mint at the Founders Day bicentennial ceremony at West Point on March 16, 2002. It was on this date 200 years ago that President Thomas Jefferson signed into law the Congressional act establishing the United States Military Academy at West Point. 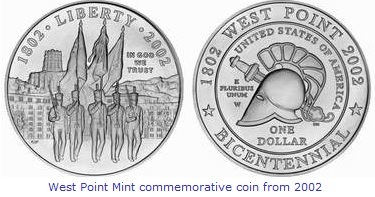 The branch facility selected to produce the bicentennial coins was, fittingly, the West Point Mint. West Point is one of America's timeless national treasures. As we look into the foreseeable future and beyond, we can reasonably anticipate the West Point Mint will answer the call of duty as faithfully as its namesake has for more than two centuries. 1 Blackwell, Jon. "A Salute to West Point." 3 United States Military Academy.